Adolph Coors Company of Golden, Colorado presented this brochure to its beer distributors promoting the Coors Pulse which could be used as advertising its product in parades and other promotional activities during the late 1980's. The Owosso Motor Car Company of Owosso, MI built about 10 Pulses with the Coors Beer color scheme and LOGO as pictured below in the brochure. Known Coors Beer Pulses include #220, #221, #233 #270, #275, #317 and #318. And Never Leave The Ground! 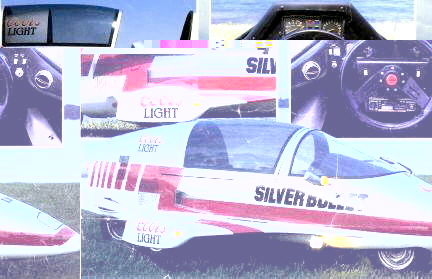 Pierce the wind in this aerodynamic two-seater When you hit the road, the Coors Light Silver Bullet Pulse Car is sure to generate excitement Imagine the thrill of motorcycle quickness with the comfort of a sports car. 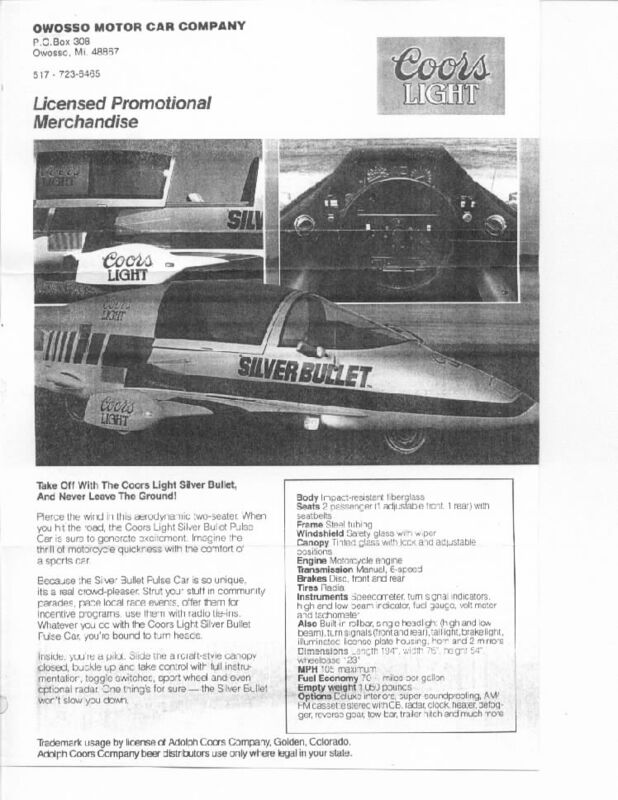 Because the Silver Bullet Pulse Car is so unique, it's a real crowd-pleases Strut your stuff in community parades, pace local race events, offer them for incentive programs, use them with radio tie-ins. 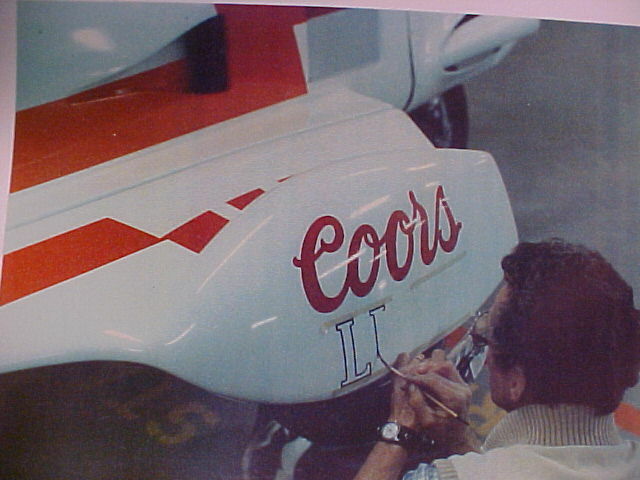 Whatever you do with the Coors Light Silver Bullet Pulse Car, you're bound to turn heads. Inside, you're a pilot. Slide the aircraft-style canopy closed, buckle up and take control with full instrumentation, toggle switches, sport wheel and even optional radar. One thing's for sure-the Silver Bullet won't slow you down. Dimensions Length 194", width 76", height 54", wheelbase 123"
Deluxe interiors, super-soundproofing, AM/FM cassette stereo with CB, radar, clock, heater, defogger, reverse gear, tow-bar, trailer hitch and much more. Trademark usage by license of Adolph Coors Company, Golden, Colorado. Adolph Coors Company beer distributors use only where legal in your state. #270, #275, #317 and #318.